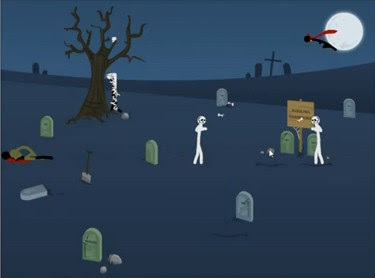 Click Death Graveyard is another new Halloween themed stick men puzzle game from bored. This is just one of the many ClickDEATH games on bored where your objective is to eliminate all the stick men in the game though you must do it without anyone seeing another one die or you lose. So how long will it take for you take out these innocent stick people? If you are having trouble trying to figure out the solution, this Click Death Graveyard walkthrough shows just how to beat the game.